Kyle Grillot - kgrillot@shawmedia.com Joseph Fine, 9, looks to his classmates during a field trip for students enrolled in the summer program at Clay Academy to McCann's Berry Farm in Woodstock Wednesday, June 24, 2014. 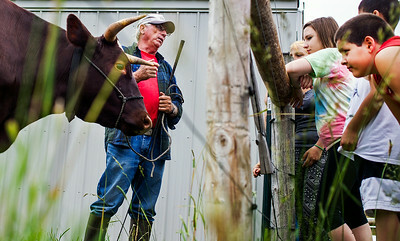 Kyle Grillot - kgrillot@shawmedia.com Bob McCann (from left), talks about his young oxen with students enrolled in the summer program at Clay Academy including, Courtney Sherman, 15, Grace Roston, 14, and Jayden Brown, 10, at McCann's Berry Farm in Woodstock. The field trip for the 35 students ranging from 1st to 12th grade was made possible through a grant from the District 200 Education Foundation.